Ahhh, ebikes. 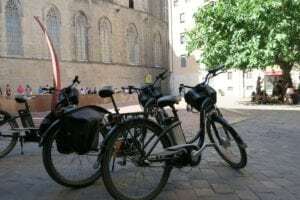 All the perks of riding a bike with none of the “legwork.” Cruise along peacefully, even down the Gothic Quarter’s most tiny hidden streets, with just a slight nudge of the pedal. Barcelona Cathedral in the Gothic Quarter. Since this giant plaza is very close to Barcelona eBikes, you’ll practice your ebiking skills here before setting off to see the rest of the city! Biking is a great way to explore because you get the same up-close experience as you would if you were walking, but you end the day with feet that are far less sore than they would be if you had conquered all those miles on foot. You’ll cover way more ground on a bike and still have the energy to lift your pitcher of sangria when the day is done. Still, riding a bike can be tiring, especially on warm Barcelona summer days. We stopped at this pier, which offered a great view of the entire city and the beach. And that’s where ebikes come in. They look like a bike and feel like a bike, but the effort required to explore is significantly less than what a bike demands. The small motor propels you forward with enough speed to quicken your trip but not so much that it’ll send you flying through the streets faster than you can peer into every shop window. 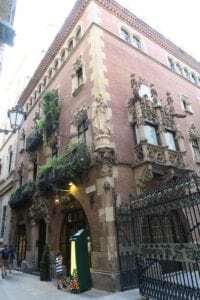 A special monument in El Born, a neighborhood with a dramatic and interesting history that played a large part in the development of Barcelona. 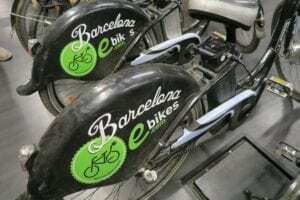 Thankfully, I’ve found Barcelona’s greatest ebike tour company: Barcelona eBikes. 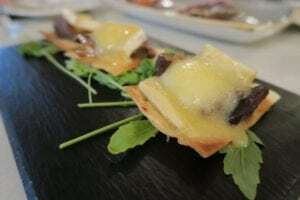 And–no surprise here–we opted for the Wine & Tapas Tasting Tour. With this tour, you’ll explore a section of the city and then finish off your biking adventure with several rounds of tapas, wine, and cava (the Spanish version of Champagne) at a historical establishment. Barcelona eBikes all charged up and ready to go! Fortunately, the day of our tour, Els Quatre Gats was on the itinerary! 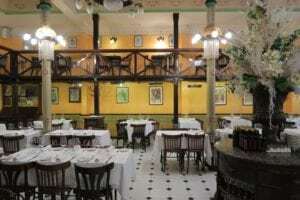 Eating here is like taking a step back in time. It is entirely charming and has been frequented by artists, celebrities, writers, and thinkers in its 120+ years of history. If it’s good enough for Pablo Picasso–4 Gats was one of his favorite hang-outs and the venue for his first exhibition at just 17 years old–it’s good enough for me! Els Quatre Gats, or 4 Gats for short, is located about 20 steps from Barcelona eBikes! Special back room of 4 Gats, where we enjoyed sampling tapas and three different local wines. Brie, mushrooms, and greens. A very yummy tapa at 4 Gats! But before the tapas and wine comes the touring. Alessia, our tour guide, was warm and friendly, and very eager to share with us the Barcelona she so dearly loves. 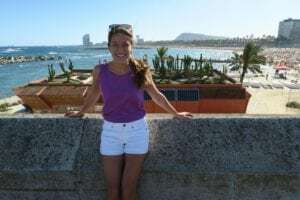 She pedaled us through El Born neighborhood, Port Olympic, the Gothic Quarter, Park Ciutadella, Barceloneta, and along the beach. The exact stops (and the duration of each) vary depending on the tour participants, but we saw and learned so much in our few short hours. At each stop, you’ll hop off your bike for a brief lesson on the significance of the place and receive some insider knowledge, and then you’ll get the chance to walk around for a bit before riding off to the next sight. Alessia and her handy-dandy binder of images to help bring the information alive! 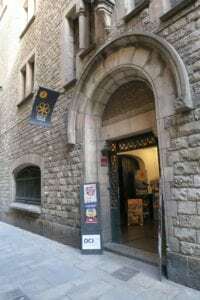 Front door of Barcelona eBikes–it could be easy to miss, so look for the hanging sign and gorgeous stonework right down the street from 4 Gats! For even more details, check out my review on TripAdvisor and give it a “helpful” vote.